A Dutch snowboarder is the first athlete to protest against Russia’s anti-gay laws, at an Olympic event in Sochi yesterday. 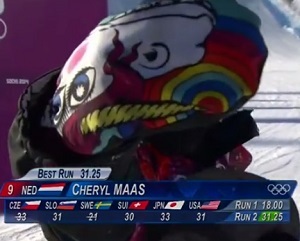 Cheryl Maas, one of just six openly gay athletes at the Games, made the protest at the Ladies’ Slopestyle event. After finishing her run, she approached the camera and showed off her rainbow-and-unicorn decorated gloves, before walking off defiantly. The 29-year-old athelete is married to Stine Brun Kjeldaas, a Norwegian former snowboarder. The Slopestyle qualifier was the first event to be held, and marks the first time in 30 years an event has been held before the Opening Ceremony at the Winter Olympics. Maas will next take to the slopes for Saturday’s Slopestyle semi-final. The Winter Olympics officially start today, with coverage of the Opening Ceremony from 15:30 GMT on BBC Two. 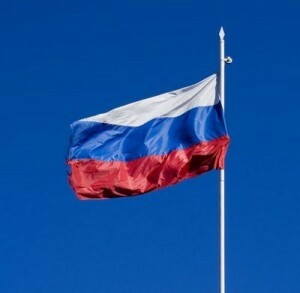 On Tuesday, lesbian Australian snowboarder Belle Brockhoff said her parents were “so worried” about her safety in Sochi.